Authentic Hatch New Mexico roasted green chile gives bold allure to this deliciously decadent and smooth paramour. Let Thy Food's lusciously creamy Chile con Queso is a spicy and passionate casanova with an irresistibly hot melt for chips, tacos, burritos, pasta, grilled cheese, fries, and various other beloveds. Each 10 oz. 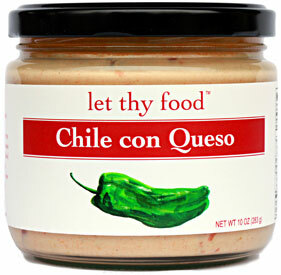 (283g) jar of Let Thy Food's Chile con Queso Dip is $9.99. From Anonymous of NY, New York on 2/2/2018 . Best vegan con queso I have had. I only put a 4 because the spice is JUST at my tolerance level. Would love to see another product same but mild. From jeff of Park City, Utah on 11/16/2017 . Nasty Nasty Nasty I bought this with low expectations, and this is just nasty nasty nasty. From Lori Beth of Fort Myers, Florida on 11/9/2017 . I purchased this for my husband based on the positive reviews. We were both very disappointed with it. This queso is nothing but heat and very little flavor. There are far better vegan queso dips out there. Sadly, not worth the $10+ we paid for it. From Jay Hickey of Virginia Beach, Virginia on 9/26/2016 . Honestly, this is the best cheese alternative queso I've had in awhile. Once you start eating it, it's hard to put back. You might want to order a few as opposed to one jar. From Micaela Gilbert of Plainview, Texas on 11/20/2015 . Out of all of the vegan cheeses that I tried so far this one is my favorite. The taste is nice although I wouldn't say that it tasted like cheese, but it was still great. I could definitely taste the beer in it, the taste of it was very different from what you'd expect in a cheese sauce but all the flavors worked well together. I just used it as a dip with chips, and I didn't try it with other foods, but I'm sure it would have tasted great with other stuff too.